Discover more the world of luxury with access to coveted designer brands and more. Just got your first job? Buy your first luxury bag at Reebonz! Reebonz is a leading online platform for buying and selling the widest range of luxury products. With an exciting line-up of coveted designer brands, personalised services, and buying and selling options, Reebonz makes luxury accessible for everyone. This online store offers an extensive range of new and pre-owned luxury bags, accessories, watches, jewellery and shoes from coveted designer labels and a curation of the world's finest merchants sold in their exclusive sale events. In addition, personal services, different ways to buy and sell, membership rewards, and personalised recommendations and knowledge differentiate this brand from the rest. To add convenience, members can also access these sale events and shop on the go with the Reebonz app, available for iPhone, iPad and Android users. This membership-based online shopping platform for luxury brands was the brainchild of Benjamin Han, Daniel Lim and Samuel Lim. Founded in 2009 in Singapore, this site has operations in Malaysia, Thailand, Indonesia, Brunei, South Korea, Australia, New Zealand, China, Hong Kong, and Taiwan. In recognition of its success and niche appeal, Reebonz has also seen investment interest from several international venture capital firms such as GGV Capital, MATRIX and VERTEX Venture. Reebonz offers customers in Malaysia style and luxury for every requirement they may have. Men and women can find exclusive products sitewide to stylise their wardrobe. 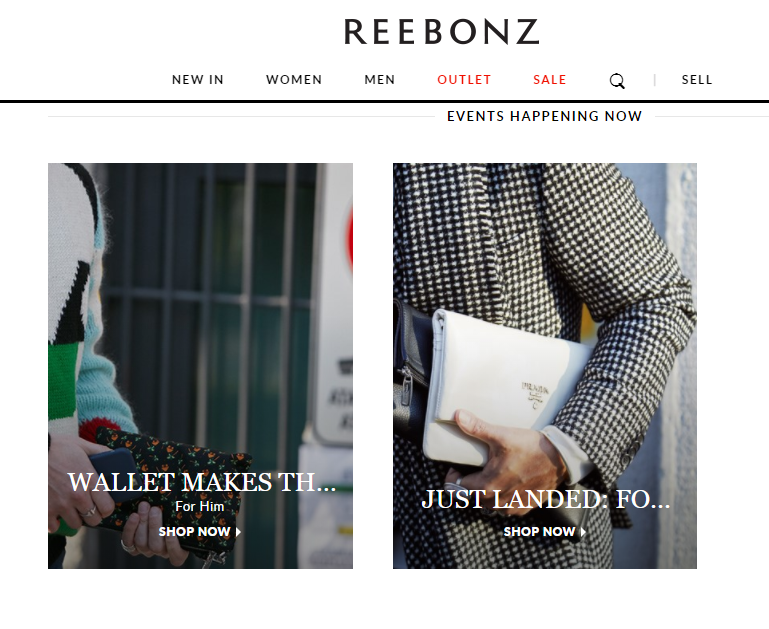 The Reebonz Malaysia website is clean, uncluttered and easy to navigate. New in: This section is perfect for those who love to adapt their wardrobe to the latest fashion trend and style. Here, one can browse through the latest accessories and clothing dominating the fashion world. Women: From trendy shoes to luxury Prada handbags, this section is dedicated entirely for women. Browse through the trendiest fashion products to create your own style statement. Men: Reebonz knows that fashion isn’t just for women but for men as well. This section is every man’s dream destination with well-tailored jackets and eye-catching watches. Outlet: Shop luxury for way less when you take an additional 10% off marked-down prices at the Outlet event. Discount will be automatically applied at checkout, so you can indulge in luxury without breaking the bank. All items sold in Reebonz Outlet are final sale. Sale: Reebonz offers time-limited special sales to its members, with more than 100 brands and nearly 220 newly launched and updated activities on average per month. 80% of website brands are high-end first-tier products. This guarantees that all commodities are authentic, and supports installments of assigned bank credit cards without any interest and handling charge. Members can also shop through a myriad of one-of-a-kind luxury products from an extensive curation of the world's finest merchants of new and pre-owned luxury via Reebonz Boutiques. This platform features a global community of independent multi-brand boutiques, pre-owned luxury merchants and vintage dealers, making even the rarest luxury item easily accessible to all members across Asia Pacific. Here are some of the products catergories available on Reebonz. Now, you don’t have to spend your time and money at multiple stores but can get access to the best designer products at a single click. In addition, Reebonz coupons, promotion offers, and deals allow you to save every time you shop. Step 1: Select the category or search for a particular product using the search bar. Members can also narrow their search with enhanced filters to shop by category, designer, colour, price range and more from product-specific catalogues that list the full range of items currently on sale. Step 2: Click on the product you like to view the details and click “Add to Bag”. In case there is an offer or discount on the product, your savings for the same will be shown here. Step 3: You can add multiple products to your bag. When done, click on the bag icon at the top-right corner of the page to view. Step 4: Check all the items in your bag carefully. In case you have any Reebonz coupon codes, enter the same in the space available and save more of your money. When done, click on Checkout. Step 5: Review your order carefully and if all fine, click on “Confirm and Pay”. Once your payment is processed you will receive an email confirming your order. Reebonz also allows you to sell your pre-owned designer items to fashionistas alike and put that savings towards your next luxury purchase! All pre-owned items on Closets and White Glove are expertly authenticated and verified by Reebonz Atelier. White Glove is a premium end-to-end sell service where Reebonz does everything to help you sell your pre-owned designer items. They’ll pick up your items and provide professional photography service together with copywriting, before listing the items for sale. In addition, you will get paid within 7 business days once your item is sold. On White Glove you can sell accessories, bags, jewellery, shoes, and small leather goods. To qualify for this service you must have at least 3 items or more; or a minimum value of MYR 10,000. The price of the items is decided based on recent sales of comparable items. Reebonz considers their own record of sales as well as online sales or auctions from other sellers. Other factors such as condition, rarity, and current trends are also considered. Payment will be made by cheque, bank transfer, Reebonz store credits or PayPal. After the item has been sold and accepted by the buyer, you will receive a notification from Reebonz and payment will be sent out within 5 business days. For more White Glove details, you can contact the customer service team on their exclusive hotline number at 03 7932 1380. This is a do-it-yourself selling platform trusted by individual luxury sellers. With authenticity guaranteed, secure delivery and hassle-free returns, snap, list and sell your designer collections to over 4 million fashion lovers worldwide. This service is not currently available in Malaysia. Reebonz Malaysia currently accepts all major credit/debit cards such as Visa, MasterCard and American Express. Instalment payment plans and bank transfers are also available for selected banks. Alternatively, members can opt to pay via PayPal. All payment methods mentioned are subjected to each country's participating banks. With every order, members on Reebonz are awarded loyalty credits that can be redeemed against future purchases. You will be rewarded loyalty credits of 0.5% from your total order value each time you shop on Reebonz. These loyalty credits can be redeemed upon checkout to offset your purchases. Keep in mind that loyalty credits will be deposited within 14 business days of your order date and will be valid for 120 days. Every member is also entitled to a membership programme such as Solitaire or Black membership status. To qualify for Solitaire membership, members have to spend a minimum of RM8,000. This membership expires after 1 year. Within these 12 months, Solitaire members must fulfil the minimum qualifier to retain their membership. Reebonz will notify members upon qualification. To qualify for Black membership, members have to spend a minimum of RM 45,000. This membership expires after 1 year. Within these 12 months, Black members must fulfil the minimum qualifier to retain their membership. Reebonz will notify members upon qualification. Along with an extensive high-end luxury range, Reebonz Malaysia also offers customers huge benefits on their orders in the form of promo codes, coupons and other special offers such as free shipping. In addition, when you shop via ShopBack, you can also enjoy additional cashback for more savings. Some of the best deals for Reebonz Malaysia on ShopBack have been detailed below. Free Delivery Reebonz offers free shipping within Malaysia except for PO box addresses with expected delivery within 5 business days. Step 1: Visit the ShopBack website and click on the Reebonz store at the bottom of the homepage. You can also use the search box to find the link to the merchant store. Step 3: If you are interested in finding a Reebonz promo code or offer, check out the Promo codes, coupon codes, vouchers and discount codes section. 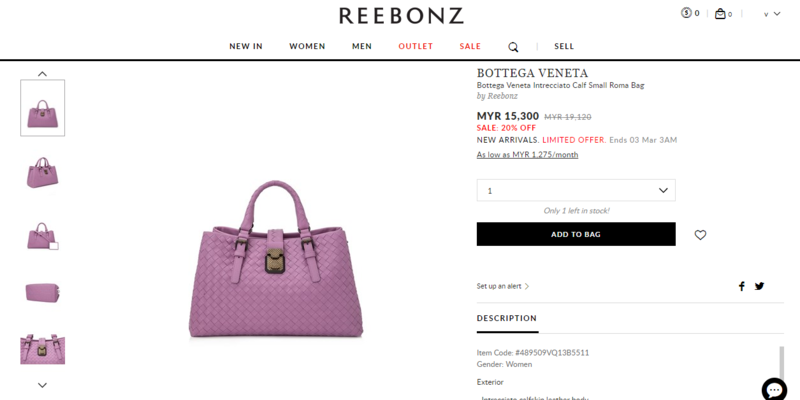 Step 4: You will be redirected to the Reebonz Malaysia website to browse and select the items. ● The item must be in its original purchase condition, including the original product packaging, manufacturer's containers, documentation, warranty cards, manuals, and all accessories. All packaging must be unmarked and not defaced in any manner. ● Any item that you received with tags attached must be returned with the same tags intact. ● An item purchased as part of a set or multi-item pack has to be returned as a whole set. ● Reebonz does not accept returns for intimates, earrings and undergarments due to hygiene reasons. ● All returned items will be reviewed by Reebonz. Items should also match the written or photographic documentation of the item's condition provided when requesting the return. Returns that do not meet these requirements will not be accepted and where applicable, customer may be charged with a fee. This Returns Policy does not apply to items that have been stated as non-exchangeable and non-refundable on the site. In case the return is approved, Reebonz may offer a full refund in credits with a validity period of 365 days. Step 3: Select your reason for return and collection date and time. A free pick-up service will be arranged to collect your items from the address specified. · When your refund has been successfully credited to your account. For any queries or concerns, customers can easily get in touch with the customer care team in Malaysia via email at conciergemy@reebonz.com or by contact their Member Relations Officer at 03-7932-1380. The team can be reached from Monday to Friday, 10.00am - 6.00pm. In addition, you can also follow the brand on social media and get the latest news on new products, promotion offers and more. For similar products, you can also check out Gilt and Shopbop on ShopBack for deals and cashbacks.